LGBTQ activists from Haifa will share their reflections on their movement’s progress and talk about their new Communities’ House for Pride and Tolerance this weekend in Boston. The tagline for A Wider Bridge (AWB) conveys its mission concisely: Equality in Israel, Equality for Israel. That goal is being successfully realized through AWB’s Impact Delegations. 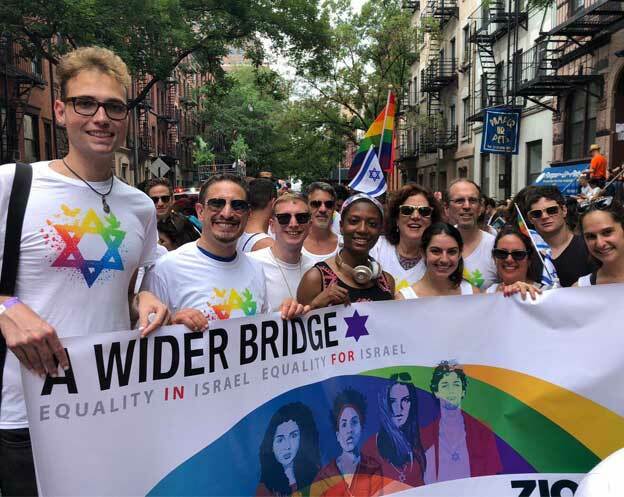 Each year AWB sponsors Israeli LGBTQ leaders to come to the United States to tell their stories and highlight the activism in their communities. This year AWB invited Arnon Allouche and Adi Sadaka to speak about Haifa’s Communities’ House for Pride and Tolerance in cities including Boston (March 23 and March 25), New York, Washington, D.C., Chicago and San Francisco. The tour is playfully called “When They Go Low, We Go Hai-fa.” Allouche is Communities’ House’s executive director, a position he came to as a school counselor and social worker for students with special needs. Sadaka is a long-time Haifa-based LGBTQ activist. Both of them spoke to JewishBoston in anticipation of their upcoming weekend in Boston. Allouche’s vision of Haifa’s LGBTQ rainbow includes honoring groups within groups, including LGBTQ teens, the first LGBTQ Arab-speaking group, LGBTQ seniors and people who come out later in life. Allouche and Sadaka noted the Communities’ House supports a group of middle-aged women who have recently stepped out of the closet. One woman, said Allouche, is so “hungry for community” that she makes the long trip from southern Israel to participate in weekly meetings in Haifa. On their American tour, Allouche and Sadaka hope to educate various constituencies about how they have built a thriving LGBTQ community outside of Tel Aviv. They will speak about the key alliances they have forged with Reform rabbis and administrators at The Leo Baeck Education Centerin Haifa. Allouche told the story of a teacher displaying a rainbow flag in her classroom. Within a few days of its appearance, LGBTQ kids in her class felt safe coming out to their peers. He also pointed out that Communities’ House has been involved in a program called V’Ahavta—the word means “love” in Hebrew—with Reform rabbis from Leo Baeck Center. The intention is to support people as they reclaim their Jewish and LGBTQ identities. “To join these two identities is very complicated in Israel,” Allouche said. Allouche and Sadaka are also cultivating a cadre of Arab activists in Haifa. Allouche observed: “LGBTQ Palestinians have a very complicated identity. We tried to build a program last year with the University of Haifa geared toward Arab activists, but the project didn’t take.” Allouche hopes this next attempt to found a faith group for LGBTQ Arabs will be successful. While progress has been made for LGBTQ people in Haifa, Allouche noted that transgender women are still in danger. Haifa, which is acknowledged as the cradle of Israeli feminism, largely remains an unwelcoming place for these women. Allouche and his staff have helped Arab transgender women fleeing for their lives. They have also advocated for transgender women in the mental health system—a system that Allouche said can be very transphobic. AWB Impact Grant To Fund Trans* Programs in Haifa!